Today, as promised, we will learn more about the properties of entities and its sub-elements. As you can see in figure 4.2.1, there are various sub-elements of entity which make it more powerful and core of an application. This is the place where you can customize the look and feel of your application as well as the functionalities of your application. Let us cash the power of Wolf Platform with efficient use of properties for these entities. 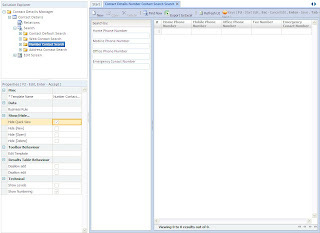 As shown in figure 4.2.2, there are three basic elements of an entity, namely: Relations, Search and Edit Screen. 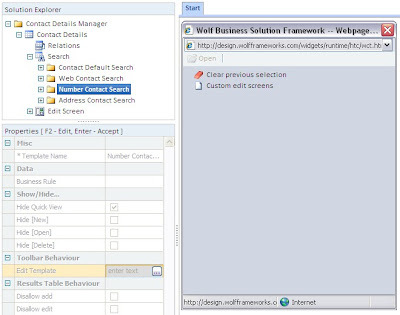 Today we will be covering the properties for sub-elements of Search element in entity. In the Search Element, we can add the Search Template for the Edit Screen we have developed. 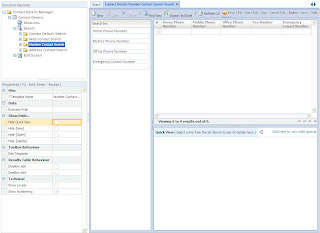 The properties of the Search Template may be configured to represent the data in the form of Search Screens, Reports, Dashboard Widgets, etc. After designing your Search Template, remember to link your Search Template to a Navigation item to make it accessible in the Run environment of the application. There are various simple and surprising properties of Search Template which we can set to make our search template look more promising. Template Name: You should give the name of your Search Template here. It is a mandatory field. Business Rule: Get the results of the search from a business rule if specified, as shown in figure 4.2.3. Leave this property blank to perform a standard search on the Entity. Figure 4.2.4: Hide Quick View Property of Search Template is disabled. 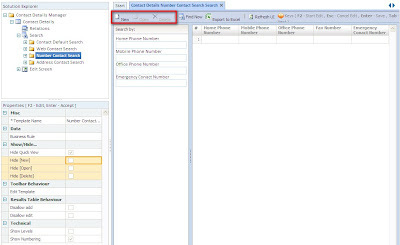 Figure 4.2.5: Hide Quick View Property of Search Template is enabled. Hide Quick View: If enabled then you will not see a non editable preview of the Entity data when an item is selected, as shown in figure 4.2.4 and figure 4.2.5. It should be used only if the Entity contains information that cannot be accommodated into the columns of [Results] table. Hide [New/Open/Delete]: If disabled/enabled, these Properties show/Hide the New/Open/Delete tool from the toolbar (refer figure 4.2.6). Edit Template: This setting allows you to control which of the defined Edit Screens should be linked to the New and Open Tools that appear on the toolbar. 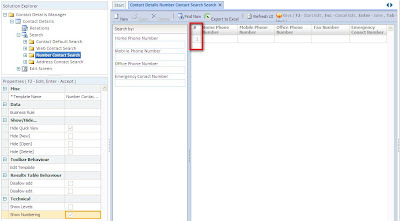 This also controls the details that are displayed in the Quick View section of the current search template If this value is left unspecified or cleared then the default Edit Screen is used (refer figure 4.2.7). Disallow Add: Disallow the user to add a record through the Results table itself. This will only work if the search does not point to a Business Rule in addition to his security privileges. Disallow Edit: Disallow the user to add a record through the Results table itself. This will only work if the search does not point to a Business Rule in addition to his security privileges. Show levels: The results table is capable of showing grouped information, as shown in figure 4.2.8. This can be set to true if every record of the results data source has a element. Show Numbering: The results table shows a numbering in the first column by default, as represented in figure 4.2.9. Uncheck here if you do not want it to be displayed. Now let us go into the next level of Search template. We will find two sub-levels of Criteria and Results. Within the Results level, we can add the fields which we want in the search screen, such as the Present Address, Permanent Address, etc. in our example of Contact Details. Let us here take example of the checkbox field, the properties of most of the fields are common and easy to use. Display Name: It is a mandatory property to give name of the field. Display Width (px) : You can also provide the width in which the particular field should be displayed. Sorting Order: Select the sorting order of the fields, either Ascending or Descending. Field1 has sorting order="0" and sort direction = "ascending"
Field2 has sorting order="1" and sort direction = "descending"
Sorting Direction: The default sort direction for the results table. Make sure that you have defined the sorting order otherwise this setting will be ignored. ReadOnly: This will determine, on checking/unchecking, if the column for this field should be readonly or not. Hidden: This will determine, on checking/unchecking, if the coulmn for this field should be hidden or not. Thus we have finally covered Search Template properties with easy, haven't we? 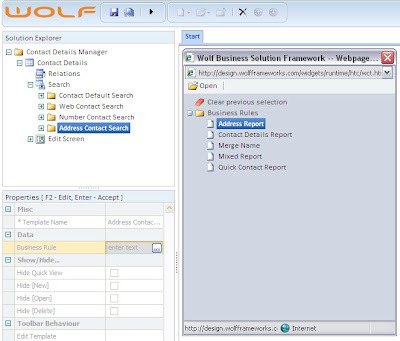 This session on properties will definitely help you extract more out of the available resources of WOLF and use them in your application smoothly. Bye, till the next session on 'Edit Screen Properties'....hope you will not miss that as this would be the most interesting and base of all the sessions.